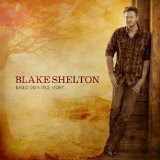 After Blake Shelton won his first CMA for Best Male Vocalist; he finally began to think he was one of the artists that would influence the direction of country music. If his latest release “Based on a True Story” is any indication, the genre is headed toward records featuring super catchy songs with homogenous themes. Every number has an infectious melody with lead single potential. The trade-off for the sonic pleasantry is a 12-song collection that is short on meaningful material but long on fun. For instance, there is a new take on the classic Take This Job And Shove It titled I Still Got A Finger. Shelton said, “You know, honestly, I’m in a good place in my life. I’m happy and thankful and I want to sound like that on the record. I want to be that guy on my albums right now. With a slew of awards, a fairy tale marriage and a great TV gig as a judge on NBC ‘s megahit, “The Voice,” Shelton’s life is smooth and stable. While it is a reflection of where he is in life, the album could have used some unpredictability.